Chicken & Veggie Foil Packets with Basil Pesto Recipe, an easy camp food recipe to throw on the grill. These camp food foil packets are super easy to make. You just cut up whatever veggies and protein you want, bring some seasonings and some foil to wrap it all up in and then you have the easiest meal ever. They’re also great for a crowd, just set out ingredients and let everyone put together a pack then toss on the grill or over the campfire. You can even just eat out of the foil (after you let it cool down) which is great for easy clean up. 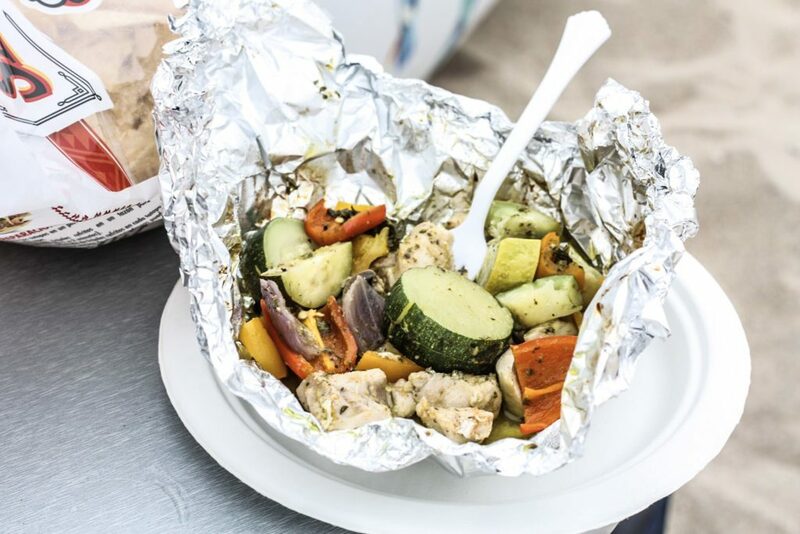 Chicken and vegetables cubed and tossed with basil pesto, cooked in a foil packet over the grill for an easy outdoor meal. Cut chicken thighs into cube sized pieces. Cut bell pepper, red onion, mushrooms into ½" sized pieces. Slice zucchini and yellow squash lengthwise, then slice every ¼" or so, creating little half circles. Lay out a foil packet about 10" x 10" - more or less depending on how much food you want to put in each packet. Add in however much chicken and veggies you want then top with a good dollop of basil pesto. Take the two edges of the foil and connect, wrap together. Do the same with the other sides of the foil. 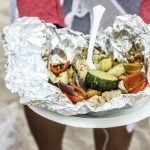 You should end up with a foil "packet" full of your food.Toss on a grill on high heat for about 10-15 minutes until chicken is cooked thoroughly. This recipe for Chicken & Veggie Foil Packets with Basil Pesto is from Mince Republic.